Chronic pain is a major problem in our society. Neural Therapy , like Prolotherapy, is an injection method of healing. Developed in the early 1900s by Ferdinand and Walter Huneke, Neural Therapy is one of the best known natural healing methods in Germany, and is now also practiced in Europe and the U.S.. Neural Therapy is designed to repair and restore normal function to the Autonomic Nervous System (ANS), that part of the nervous system responsible for the “automatic” functions of the body such as immune function, circulation, and the production of hormones. As early as 1905, researchers noted that illness and dysfunction are almost always preceded by a dysfunction of the ANS. Neural Therapy, when correctly done, repairs ANS dysfunction, restoring the body’s healing capacity, allowing Prolotherapy, if still needed, to work more effectively. This article explores the history and science behind this fascinating treatment. Chronic pain, especially musculoskeletal pain, is a major problem in our society.1-4 The annual cost of chronic pain in the United States, including healthcare expenses, lost income, and lost productivity, for low back pain alone is estimated to be $85.9 billion,5 with arthritis costing $128 billion.6 In fact, pain is the second leading cause of medically related work absenteeism, resulting in more than 50 million lost workdays each year,7 with headache, arthritis, back pain and other musculoskeletal conditions costing $61.2 billion per year.8 It is a major problem not just because of its prevalence, but also because of the general lack of effective treatment for patients afflicted with chronic pain.9-11 When I was in medical school learning how to treat these patients, diagnosis and treatment was reduced to an algorithm or “recipe.” These formulas supposedly guide the doctor through the proper diagnosis and treatment of various pain complaints. I dutifully memorized these algorithms and when I began practice, I applied them just as I was taught. The problem is that they do not work most of the time. I would go through the algorithm as I had been taught, but most of the time the patient would be only slightly improved, if at all, and sometimes they would even get worse! I began to realize that what I had learned was at best incomplete, and at worst, wrong. I then began a long quest for more knowledge by attending numerous conferences, seminars and workshops all over the country that had to do with pain treatment. Some of these techniques were as ineffective as the algorithms, or worse. Some techniques worked, but were very labor intensive and inefficient, but occasionally I encountered information that was stellar. I have woven these different stellar techniques into a treatment protocol, which I have found in my practice to be much more effective in permanently resolving chronic pain problems. Two of the most effective treatments I found were Prolotherapy and Neural Therapy. When used together, Prolotherapy and Neural Therapy are incredibly effective in resolving even the most complex pain issues. Neural Therapy, like Prolotherapy, is an injection treatment that stimulates healing.12 Neural Therapy is one of the best-known natural healing methods in Germany and is now also practiced in other countries in Europe and the United States. Neural Therapy is designed to repair dysfunction of the autonomic nervous system, that part of the nervous system responsible for the “automatic” functions of the body, including the immune system, circulation, hormone release, and thus healing ability. Ricter, a German scientist, did animal experiments to study the relationship between the nervous system, circulation, and healing, and noted in 1905 the profound and senior influence of the autonomic nervous system. He concluded that illness and dysfunction, were always preceded by a disturbance of the autonomic nervous system, which disturbance then adversely affected the circulation to the particular tissue, limiting healing and predisposing the individual to the problem.13 This is especially important in the musculoskeletal system since proper blood supply to injury is so important in healing.14, 15 An example would be if there was an injury to the autonomic nervous system that caused it to restrict blood flow to the low back, then day to day healing of that area would be diminished. Normal “wear and tear” which should heal, doesn’t, and eventually that individual could develop back pain that did not resolve. Prolotherapy could, of course, help the injured ligaments and tendons, but if blood flow is poor because of that prior injury and damage to the lumbar nerve plexus, Prolotherapy treatment might be slow or reach a point and plateau, or not work at all, until that blood flow was restored with correctly placed Neural Therapy injections. Figure 1. 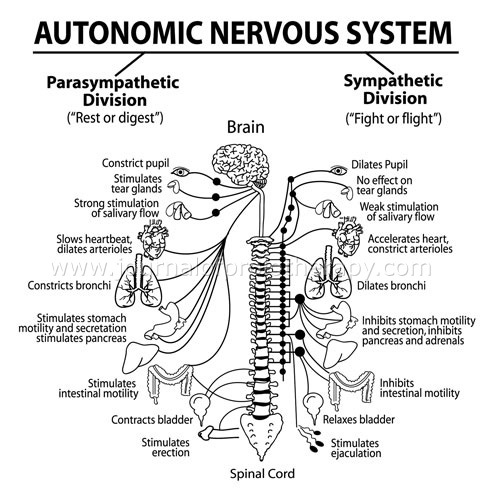 The autonomic nervous system. Neural Therapy is based on the theory that any trauma, infection, or surgery can damage a portion of the autonomic nervous system and produce long-standing disturbances in the electrochemical or electromagnetic functions of these tissues.28 These disturbances are also known as “interference fields” because they interfere with normal function and healing. When these “interference fields” persist and the autonomic nervous system is injured or not functioning correctly, various consequences can result such as incomplete healing,29 including incomplete healing of soft tissue injuries and chronic pain. In my experience, these interference fields and resulting dysfunction can last indefinitely unless repaired. Figure 2. Healthy versus unhealthy nerve cell membrane resting potential and what happens when stimulated. Figure 3. Proposed mechanism of how Neural Therapy helps sick cells heal. Figure 4. Neural Therapy of a surgical scar. Figure 5. Neural Therapy of sphenopalatine ganglion by Jurgen Huneke, MD, of Germany, at Neural Therapy conference. There is also the phenomena of interference fields affecting areas at a distance. This was demonstrated when in 1940, Ferdinand Huneke injected procaine into the shoulder of a patient with a severe and therapy-resistant frozen shoulder. 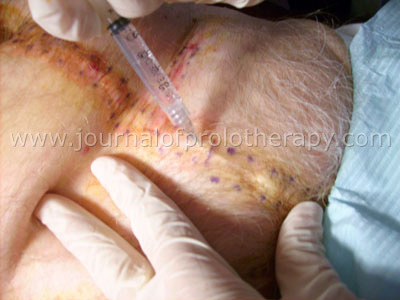 No immediate relief was noted by the patient however several days after the shoulder injection the patient developed severe itching in a scar on her leg. That itching scar was injected and within seconds the patient obtained full, painless range of motion in the previously frozen shoulder. Review of history revealed the patient had previous surgery on that leg because of osteomyelitis. The surgery had been considered successful, but shortly after the surgery the patient had developed the frozen shoulder. Huneke recognized the therapeutic importance of this “lightening reaction,”39, 40 with the scar on the leg being the site of the actual interference field. Figure 6. 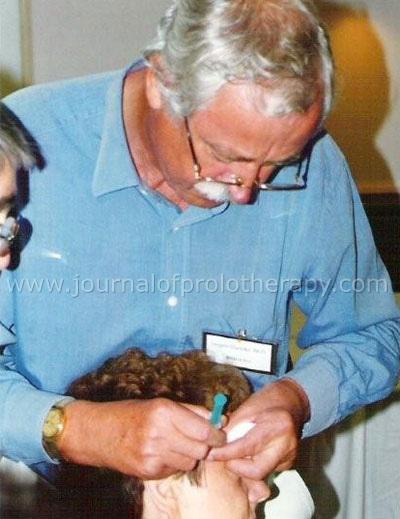 Jurgen Huneke, president of the International Association for Neural Therapy, demonstrating injection of the inferior hypogastric plexus at a Neural Therapy conference. So we have Neural Therapy, and we have Prolotherapy. Where should the doctor start in his/her treatment? To understand that answer, I will explain how I developed my own treatment protocol. After years of study and treatment of patients, I concluded that there are three layers of musculoskeletal pain. First Layer: The first layer is that of muscle spasms. The important thing to remember about muscle spasms is that they are usually only a symptom, not a problem in and of themselves. When the body is injured or unstable, it will tighten the muscles around the unstable, weak or injured area in an attempt to stabilize it. Unfortunately, the muscles are not designed to remain in a constant state of contraction for prolonged periods. They are designed to flex and relax as one goes about daily activities. When the muscles are tightly contracted for prolonged periods, waste products such as lactic acid start to accumulate in the muscle and they will begin to cramp and hurt. So, other than the fact that the muscle spasms indicate areas where the body is detecting something wrong, I generally do not waste too much time on them to begin with as they will usually resolve spontaneously once the underlying problem is treated. Third Layer: The bottom layer of the three is the layer of autonomic nervous system (ANS) dysfunction. Once the ANS is disrupted, from whatever cause, there are several effects that result. One is pain. Pain from the ANS can go on as long as the dysfunction persists. My record so far is 60 years in one patient. The second effect of ANS dysfunction is that function is altered, usually in respect to decreased blood flow to the area of the body that is controlled by that part of the ANS. This causes chronic under-nourishment of the affected body tissues, and results in progressive weakness, especially in connective tissue. The third effect of ANS dysfunction is tightening of the connective tissue around the area of ANS dysfunction. This is significant because although the connective tissue will bend and twist easily, it does not stretch much at all. Since the connective tissue cannot stretch and absorb this pull, it will transfer the force down its entire length to whatever bone it connects to. This results in restrictions or tightness in certain ranges of motion, and if present long enough or if the patient sustains some sort of high-energy trauma, it can cause the connective tissue to begin to tear loose from the bone. This will then result in a “second layer” (connective tissue) problem. So how does the doctor chose which treatment to start with? In my practice I start at the “third layer” (ANS) and work up. I first check and repair ANS dysfunction with Neural Therapy, then any connective tissue weakness or instability with Prolotherapy, followed by physical therapy to rehabilitate the muscles. While I practice in this order, other orders of treatment can also be effective. For instance, treating a straight forward soft tissue injury with Prolotherapy first. However, if healing with Prolotherapy injections is slow or pain remains, then this is an indication that an underlying autonomic nervous system issue is present and that Neural Therapy would be appropriate. Once the ANS dysfunction is corrected usually a large percentage of the patient’s pain will subside, and sometimes virtually all their pain will be gone. In many cases, however, the connective tissue damage will be so bad that even with normal ANS function the body is unable to completely repair it. In these cases we move up to the next level of treatment, the connective tissue layer. Connective tissue damage is treated with Prolotherapy. A phenomena well recognized by the Neural Therapy practitioner is emotional release after Neural Therapy injections which is typically unpleasant emotions associated with the trauma sites being injected.57 This release can start during a treatment and last for a few days afterwards, or may not occur at all. Warning the patient of this occurrence is usually sufficient to prevent misinterpretation of this expected phenomena or the patient assigning these unpleasant emotions to something in the patient’s current environment. Once the patient’s pain level has decreased to low levels from either the Neural and/or Prolotherapy, then the patient is placed into a progressive physical therapy and rehabilitation program. This reconditioning is essential to prevent re-injury, because the patient’s body is usually very weak and deconditioned because of their restricted physical activity and inability to exercise. Absolute: Neural Therapy injections are not done into an area where there is an active cancer or active infection. Relative: Disease states resulting from severe nutritional deficiencies or genetic illness because it will not help. Unstable diabetes, because it can cause instability in blood sugar. Of course, pregnancy anywhere near the uterus, because of possibly triggering a miscarriage. Also, severe psychological disorders are a relative contraindication because the emotional releases can destabilize the psychological state. Training for doctors is available through the American College of Osteopathic Sclerotherapeutic Pain Management, a group which teaches both Prolotherapy and Neural Therapy. I routinely lecture at the ACOSPM spring conference (check www.acospm.com for details). Workshops specific to Neural Therapy and Autonomic Response Testing are also given by Dietrich Klinghardt, MD, PhD, of the American Academy of Neural Therapy, www.klinghardtacademy.com. 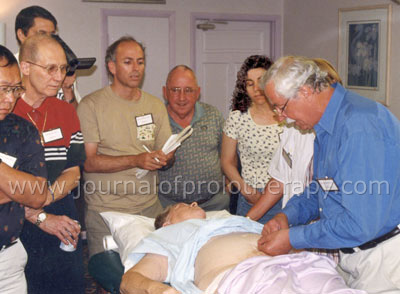 Other workshops and seminars are given by Dr. Robert Kidd, www.neuraltherapybook.com. Dr. Kidd has also written a book on the subject available on the website. The effective treatment of chronic pain can be a challenging, but rewarding, activity. The pain practitioner is advised to become proficient in any treatment which may help him/her interpret and treat even the most difficult patients. 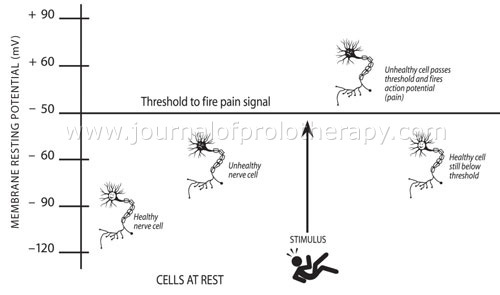 Neural Therapy, when needed, can be integrated with Prolotherapy. This combination can be very effective in the treatment of chronic musculoskeletal pain because it increases healing capacity and allows Prolotherapy to work even more effectively. 71 year-old male who presented with a chief complaint of low back pain for 46 years. His first episode at age 25 was sudden onset treated with bed rest and chiropractic. The episodes continued to occur four to five times per year, and increased in duration and frequency until they were virtually continuous. Eventually, the patient received a surgical consult, told there was no surgical pathology and sent for physical therapy which provided little benefit. At the time he was seen at my office he had continuous low back pain, only varying in intensity. His only surgical history was ganglion cyst removal on his left wrist, surgery on his right wrist for unknown reasons, removal of a calcified saliva gland with complications of a “numb spot” on his lower lip that was slowly improving, as well as two wisdom teeth removals in his 20’s and multiple root canals. Autonomic response testing was done and the patient was found to have interference fields at the wrist scars bilaterally, at the inferior hypogastric plexus, and inferior cervical plexus. Testing also revealed a correlation between the inferior hypogastric plexus, the right wrist scar, and his low back pain. Treatment was initiated with Neural Therapy to all found interference fields. The patient returned three weeks later for follow-up and reported significant improvement in his low back pain. The patient was treated three more times with Neural Therapy at two to three week intervals before Autonomic Response Testing revealed all interference fields to be resolved. At this point, the patient stated that his pain was occasionally gone, but that he had some intermittent areas in his low back which still caused pain. Prolotherapy was then commenced. A total of four Prolotherapy treatments were done at three to four week intervals. When the patient presented for his last treatment four months after his first visit, he stated that he had no more noticeable pain at all. He was discharged from treatment. Dr. Harris performing an inferior hypogastric plexus block. 35 year-old female with history of low back pain for 10 years following a motor vehicle accident. Chiropractic adjustments did not resolve the pain and, in fact, aggravated it. The patient was also diagnosed with cervical cancer and had a complete hysterectomy approximately five years ago. At that time lymph node resection done on her right side removed 20 inguinal lymph nodes and left the patient with loss of feeling and numbness in her right pubic area and right side of thigh. After healing from surgery, the patient suffered musculoskeletal low back pain and leg pain. A lumbar spine MRI was negative for radiculopathy. The patient received several Prolotherapy treatments which gave her 75% improvement, as well as a Platelet Rich Plasma (PRP) injection treatment which gave her much more strength and further reduction of pain to 90%. This intense improvement lasted six months after which improvement went back to 75-80%, with low back pain after certain types of physical activity. During this time, the patient went on a hiking trip and hit her head on the inside of a camper shell, after which she was diagnosed with facial neuralgia and had recurrent episodes of burning facial pain, only partially helped with Neurontin. When seen at the time of her first Neural Therapy evaluation, patient was still improved in her low back (75% overall) but was getting recurrent flares of low back, and still suffering almost constant episodes of intense neuralgia facial pain. Autonomic Response Testing was positive for interference fields in the patient’s upper molars, inferior hypogastric plexis, the hysterectomy and left knee scars, and the tattoo on the patient’s low back. These regions were then treated with 1% procaine. The patient had good pain relief, and almost complete resolution of her facial neuralgia pain, as well as emotional release manifested in unexplained episodes of grief during the week following her first treatment. The second treatment addressed these similar areas as well as adding the hypogastric nerve plexus. The patient then had complete relief of her facial neuralgia pain, but low back pain remained. For the third treatment, Autonomic Response Testing showed that the interference fields treated in the second treatment had returned. For this reason, a more thorough search was done for any missed fields and a region in between the two halves of large tattoo on the patient’s low back was discovered. This new region was injected with 1% procaine. The patient had profound improvement of her low back pain after this treatment, with continuation of no facial pain, and also has begun to experience return of feeling in the previously numb areas of her right pelvic region and thigh that had been affected previously after the lymph node dissection. 75 year-old male with chief complaint of bilateral foot pain for several years. He reported a long history of running, including marathon running, and that he had been unable to participate in this sport for the last several years because of this foot pain. Surgical history included a compound fracture with open reduction of his left forearm and wrist, and left inguinal hernia repair with mesh placement. Evaluation of his autonomic nervous system by Autonomic Response Testing showed autonomic interference fields at the inguinal hernia and surgical scar, the inferior hypogastric plexus and at all his left wrist scars. The patient elected to do Prolotherapy before doing Neural Therapy. His foot pain improved greatly with the Prolotherapy, however, plateaued at the eighth treatment. Neural Therapy was then done on all interference fields which retested positive, at one week intervals. After six treatments, the patient reported all his foot pain had resolved, and has been able to return to running. His final exam showed no remaining interference fields present. American Pain Society. Pain assessment and treatment in the managed care environment. January 22, 2000. Available at www.ampainsoc.org/advocacy/assess_treat_mce.htm. Severeijns, et al. Pain catastrophizing and consequences of musculoskeletal pain: A prospective study in the Dutch community. The Journal of Pain. (Vol.6, Issue 2). Denison, et al. Musculoskeletal pain in primary health care: Subgroups based on pain intensity, disability, self-efficacy, and fear-avoidance variables. The Journal of Pain. (Vol.8, Issue 1). Martin, et al. Expenditures and health status among adults with back and neck problems. JAMA. 2008;229(6):656-664. Centers for Disease Control and Prevention. Targeting arthritis: Improving quality of life for more than 46 million Americans. At a Glance 2008. Retrieved March 6, 2008 from http://www.cdc.gov/nccdphp/publications/aag/arthritis.htm. Stewart, et al. Lost production time and cost due to common pain complaints in the US workforce. JAMA. 2003;290:2443-2454. Turk D. Clinical effectiveness and cost-effectiveness of treatments for patients with chronic pain. Clinical Journal of Pain. Volume 18. Issue 6:355-65. McQuay, et al. Systematic review of outpatient services for chronic pain control. Health Technol Assess. (Vol.1, Issue 6). Cherkin, et al. Physician views about treating low back pain. The results of a national survey. Spine. (Vol.20, Issue 1). Dosch P. Manual of Neural Therapy According to Huneke. 1st English ed. (translation of 11th German ed. Revised). Lindsay A., translator. Heidelberg, Germany: Karl F. Haug Publishers; 1984. Ricker G. Pathologie als Naturwissenschraft Relationpathologie. (Pathology as One of the Natural Sciences; Relative Pathology) J. Springer Verlag, Berlin 1924 – Allgemeine Pathophysiologie von A.D. SPERANSKY. Hippokrates Verlag, Stuttgart 1948, referenced in Dosch. P. Manual of Neural Therapy According to Huneke. 1st English ed. (translation of 11th German ed. Revised). Lindsay A., translator. Heidelberg, Germany: Karl F. Haug Phubishers; 1984, p. 38-9. Woo S, et al. Injury and Repair of the Musculoskeletal Soft Tissues. Park Ridge, IL, American Academy of Orthopedic Surgeons, 1987. Alderman D. Free Yourself From Chronic Pain, How Prolotherapy Can Help You Become Pain Free. Family Doctor Press, Glendale, California, 2008, p. 14. Dosch P. Manual of Neural Therapy According to Huneke. 1st English ed. (translation of 11th German ed. Revised). Lindsay A., translator. Heidelberg, Germany: Karl F. Haug Publishers; 1984. Part 1-A-1, Chronological survey; p. 25-29. Klinghardt D. “Neural Therapy,” presentation at Neural Therapy Training Seminar, 1993. Goodman, et al. The Pharmacological Basis of Therapeutics. The MacMillan Company, New York, 1965; p. 372. Huenke J. “Neural Therapy by Huneke” presentation at Autonomic Nervous System Dysfunction Seminar, May 13-15, 1999, sponsored by Caring Medical & Rehabilitation, Sanibel 6 Island, Florida. Dosch P. Manual of Neural Therapy According to Huneke. 1st English ed. (translation of 11th German ed. Revised). Lindsay A., translator. Heidelberg, Germany: Karl F. Haug Publishers; 1984. Part 1-A-1, Chronological survey; p. 26. Klinghardt D. Neural Therapy. Townsend Letter for Doctors and Patients. July 1995, pp. 96-98., also in Hauser R, et al. Prolo Your Pain Away!, 2nd Edition, Beulah Land Press, Appendix A, p. 284. Klinghardt D. “Neural Therapy” presentation at Neural Therapy Training Seminar, 1993. Huenke J. “Neural Therapy by Huneke” presentation at Autonomic Nervous System Dysfunction Seminar, May 13-15, 1999, sponsored by Caring Medical & Rehabilitation, Sanibal Island, Florida. Merck Manual Home Edition online, “Autonomic Nervous System Disorders”, http://www.merck.com/mmhe/sec06/ch098666/ch098666a.html. Huenke J. “Neural Therapy by Huneke” presentation at Autonomic Nervous System Dysfunction Seminar, May 13-15, 1999, sponsored by Caring Medical & Rehabilitation Services. Ricker G. Pathologie als Naturwissenschraft Relationpathologie. (Pathology as One of the Natural Sciences; Relative Pathology) J. Springer Verlag, Berlin 1924 – Allgemeine Pathophysiologie von A.D. SPERANSKY. Hippokrates Verlag, Stuttgart 1948, referenced in Dosch P. Manual of Neural Therapy According to Huneke. 1st English ed. (translation of 11th German ed. Revised). Lindsay A., translator. Heidelberg, Germany: Karl F. Haug Phubishers; 1984, p. 38-9. Dosch P. Manual of Neural Therapy According to Huneke. 1st English ed. (translation of 11th German ed. Revised). Lindsay A., translator. Heidelberg, Germany: Karl F. Haug Publishers; 1984, p. 55. Guyton. Textbook of Medical Physiology. W.B. Saunders Company, Philadelphia, 1991, Chapter 5 “Membrane Potentials and Action Potentials,” p. 51-65. Steinhausler F. Membrane resting potential (MRP) as indicator of cell transformation in human lung biopsy samples (preliminary report). 2nd International workshop on experimental oncology. Madison, Wisconsin, May 29 and 30, 1981. Kokoschinegg P. Private Mitteilung, zur Publikation vorgesehen, and Steinhausler, F.: Membrane resting potential (MRP) as indicator of cell transformation in human lung biopsy samples (preliminary report). 2nd International workshop on experimental oncology. Madison, Wisconsin, May 29 and 30, 1981, both as cited in Dosch, Peter. Facts About Neural Therapy. First English Edition. Heidelberg, Germany: Haug Publishers, 1985, p. 56-7. Dosch P. Manual of Neural Therapy According to Huneke. Karl Haug Publishers, Heidelberg, 1984. Dosch P. Facts About Neural Therapy. First English Edition. Heidelberg, Germany: Haug Publishers, 1985. Hsieh CY, et al. Reliability of manual muscle testing with a computerized dynamometer. J. Manipulative Physiol. Ther. 1990; 13(2): 72-82. Schmitt WH, et al. Correlation of applied kinesiology muscle testing findings with serum immunoglobulin levels for food allergies. Int. J. Neurosci. 1998; 96(3-4):237-44. Peterson KB. A preliminary inquiry into manual muscle testing response in phobic and control subjects exposed to threatening stimuli. J. Manipulative Physiol Ther. 1996;19(5)310-6. Klinghardt D. “Neural Therapy”, presentation at Neural Therapy Training Seminar, 1993. +toxicity+vs+procaine+toxicity&cd=6&hl=en&ct=clnk&gl=us.E-medicine: Toxicity, Local Anesthetics: http://74.125.95.132/search?q=cache:-x1-OyVpYhEJ:emedicine.medscape.com/article/819628-overview+procaine+toxic+dose&cd=3&hl=en&ct=clnk&gl=us. Dosch P. Manual of Neural Therapy According to Huneke. 1st English ed. (translation of 11th German ed. Revised). Lindsay A., translator. Heidelberg, Germany: Karl F. Haug Publishers; 1984, “Alphabetical List of Conditions and Indications”, p. 171-315. Browner B. Skeletal Trauma. Volume 1. WB Saunders. Philadelphia, PA 1992, p. 87-88. Alderman D. Prolotherapy for musculoskeletal pain. Practical Pain Management. Jan/Feb 2007. Hackett GS, et al. Ligament and Tendon Relaxation Treated by Prolotherapy. (1956 First Edition Charles C. Thomas, Publisher), Fifth Edition Gustav A. Hemwall, Publisher, Institute in Basic Life Principles, Oak Brook, IL, 1991. Hauser R, et al. Prolo Your Pain Away! 2nd Edition. Beulah Land Press, Oak Park, IL 2004, p.42. Alderman D. Prolotherapy for musculoskeletal pain. Practical Pain Management Journal. Jan/Feb 2007. 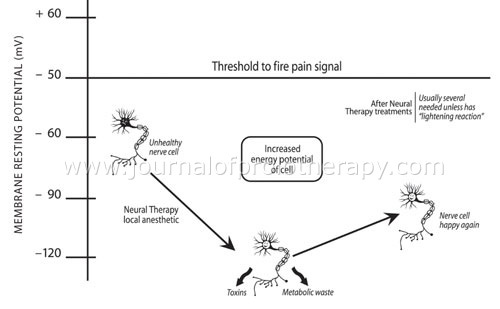 ANS, autonomic nervous system, chronic pain treatment, huneke, musculoskeletal pain, neural therapy, Prolotherapy Research, regional pain syndrome, Gerald R. Harris, DO, Volume 2 : Issue 2 : May 2010, Wonder Why?